I am currently looking into organising a weekend workshop in live willow structures in West Cork, which has inspired me to write a post on the topic. I have always liked the ides of willow structures and am looking forward to the opportunity of creating one. Willow has been highly valued since ancient times. The Celts considered it sacred. It has been used medicinally, as a dye plant, to make charcoal and as a timber. In more recent times, as we strive for green alternatives willow is undergoing a renaissance. One of its new uses is to create living willow structures. Living willow has long been used for fencing. Once developed it makes a very strong and affective barrier for animals, because when willows are planted close to one another and twined together they will actually graft into one another. Live willow fences are still used in today’s gardens and can be a unique feature in any garden. Long un-rooted willow cuttings (whips) can be used to make these functional and attractive structures/barriers in the garden that will grow and develop throughout the years. For example, woven screens, arbours or bowers over seats, arches, tunnels, children's play domes (which could be interconnected with tunnels if you have the space), and then you could use them to support climbing plants such as roses, honeysuckle, golden hop or clematis. Any variety with sufficient growth can be used but the faster growing varieties that produce long straight whips are best especially for larger structures. Viminalis varieties are probably the most suitable but others can be used for varying stem colour/leaf/catkin interest within the structure. In Germany there is a company called Sanfte Strukturen, here they bring living willow structures to an entirely new level. Here is an example of one of there projects. The Auer World Palace was built in March / April 1998 with 300 volunteers from all over the world. Marcel Kalberer was assisted by builders, architects and artists, who guide the many different volunteers through the construction of the palace. While the construction was a social event, the Palace itself would soon be used as a center for community festivities. The full moon events for example are already legendary and have drawn more than 80,000 visitors from near and far. Every event has its own character due to changing cultural activities and light installations. As the first Living Willow Palace it became a very welcome and necessary tourist attraction in the sleepy countryside between Weimar and Naumburg. If anyone would be interested in doing a weekend course in living willow structures in the West Cork, please do let me know. 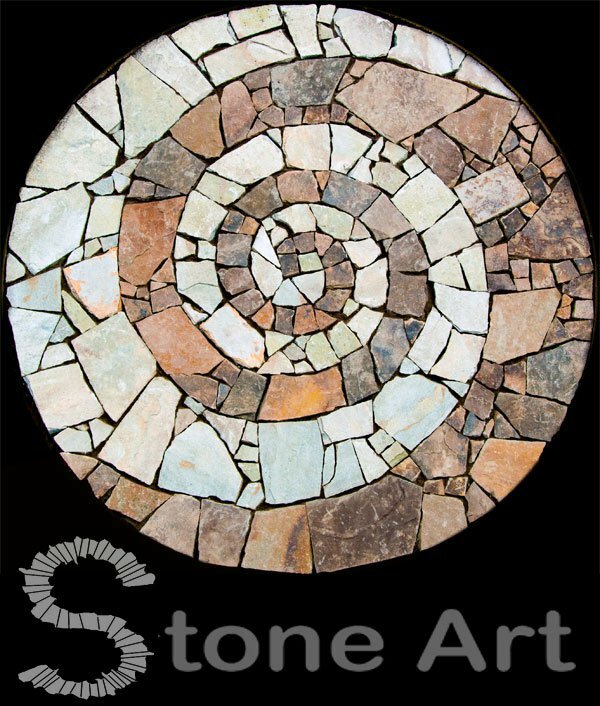 Thanks for your comment on the mosaics, and I have come to your blog and look what I have found! I have always wanted to do one of these living willow structures, as you would know, there are willows everywhere in Christchurch, and my daughter use to go to the rudolf steiner school where the children used to be taught to make very basic "huts" - what fun! You can't help but want to go inside and read or eat or huddle with friends. I thought it would be nice to have a gazebo type of living willow structure and I see this is what you are doing. Wish I was in Ireland with you and your living willows!! Wow, these are complex and lovely...the willow is one of my favorite trees. I didn't know about the structures that can be made from planting them close and twining. Quite amazing! Thanks for sharing something very new to me. How fascinating and so beautiful. I would be very interested in seeing what you create. I love structures that can be made using plants. wow, this is really cool. I live in South Africa and wonder if there is an equivalent indigenous tree we could use. You have a super gorgeous blog! Everythng you create is magical and beautiful. Thank you for visiting Esther's Boring Garden Blog. I hope you will say more when you visit again. I was going to ask how you came across it but see from the comments you have received already that it was probably through Blotanical. The structures you illustrate here are, indeed, very beautiful and imgainative. I immediately want to walk inside. Good luck with your workshop. Hope it's fun. What a fascinating blog! I've never seen willow structures or even knew they could grow and be trained like this. I'd love a willow fence here but no willows in my yard:( The stone sculpture is pretty cool. To see Mt. Rushmore is on my bucket list. It is an amazing feat of huge dimensions. The Crazy Horse memorial is neat too. I think one man was working on it forever? It is great. What amazing structures! To be admired for sure. Thanks for the interesting post! It looks like you can make some terrific designs with those willows... everything from a Gazebo to a fence. The fact that the willows are still live and grow and change over the years makes them very interesting. 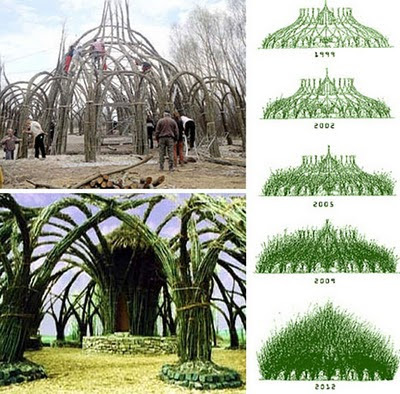 Those willow structures are very cool. I especially like the look of the Belgian Fence. Thanks so much for commenting on my blog so that I could find yours. These willow structures are amazing. I had no idea you could do anything like this. Wish I could grow them here. Great post. I have never seen those before and they are really pretty! It is definitely a piece of art in the garden. Incredible and fascinating! I've seen willow cloches (is that the right word, coverings to protect plants from critters) but have never seen structures. I wonder if I could make a willow gazebo...great food for thought, thank you!! Really cool structures. We've done a simple willow fence before, but nothing like this. It seems to be getting more popular recently. I saw an interesting little house at the Cornerstone garden show in Sonoma this past fall. Hi Sunny, oh oh oh, this is fabulous! I wish I could come and learn. We have tried various willow fences, and have some of the images you have shown saved for inspiration. It is the engineering that we don't understand very well. Someday we will plant/build one of these. How wonderful! In my earlier gardening days when I was trying to get "walls" in the garden, I went down to the creek and picked willow and "wove" a bit of a wall. And, yes it sprouted. 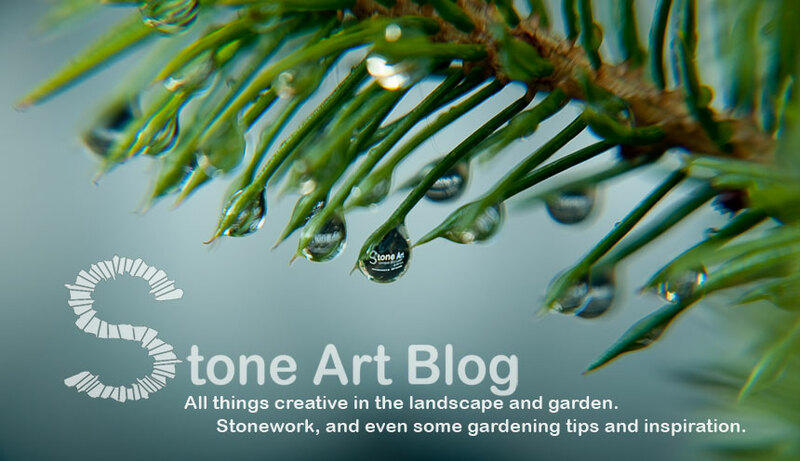 Lovely to see you on our blog - I love the images you've put up and the Sanfte Strukturen group is very interesting - a lot of their site in English, everyone should have a peek. Willow "fedges" are really good for gardens where space is tight, as they take up less width than a normal hedge. They need a sunny spot and you must must must take good care of them - they can easily put on over a metre of growth each year from their sideshoots. One lazy year and it will go haywire! I have seen some of these in BBC shows and it always surprises me with how they grow back and look so natural .. truly natures gift ? to us to make such wonderful living structures ! I just have to try something like this. It would put my Sumac bower and clematis Tee Pee to shame. One quick visit here and I'm overwhelmed with project ideas.